This YouTube Livestream is was broadcast using a multiple camera live streaming video system from CCTV Camera Pros. The system uses 16 HD CCTV cameras that are connected to a video multiplexer. This is a demonstration of a high-definition YouTube video livestream using a multiple camera streaming system. The system allows you to easily switch between various multi-camera screen layouts using the remote control. That's what I'm doing right now. I can easily switch between single camera views like these, as well as multiple camera views like this four-camera screen, nine-camera screen, sixteen-camera screen view. The system also supports picture in picture, this alternate four-camera view, dual camera view vertical, dual camera view horizontal. This is a diagram of the video streaming system that I'm using. Basically, I have 16 cameras that these are high definition security cameras. They're HD, HD-TVI, and HDCVI type cameras, and they are hard-wired back to a VM-HD16 video multiplexer. They're hardwired to that multiplexer using RG59 coax cable. The multiplexer is what enables me to switch between the different screen views and to combine multiple cameras into single screens. That multiplexer is connected to a livestream PC that has a HDMI Black Magic Capture Card in it, and it's running Open Broadcaster Software. 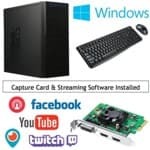 The multiplexer connects to the streaming PC using an HDMI cable, and then the streaming PC is connected to a high-speed Internet connection, and then you're able to stream to all the major video streaming platforms, like YouTube, Facebook, Twitch, Twitter Periscope, and others. I'm controlling the screens, you'll see in a minute, I'll go back to the live view, using the wireless remote control that comes with the video multiplexer. So, I'm going to switch back to the live view again, and, again, for those of you that are just joining, this is a demonstration of a high definition multiple camera streaming system that uses a video multiplexer. The multiplexer allows me to easily switch between various screen views. I switch to the nine-camera view. Here, you can see all sixteen cameras that are connected to the multiplexer. I can easily switch to full screen views of single cameras. This is a combination of obviously different indoor and outdoor... These are actually high definition security cameras, but by using a video multiplexer to combine the signal and then sending that signal via HDMI to a streaming PC, I'm able to livestream on YouTube like you're seeing now, and it also works again great with Facebook and Twitch TV and Periscope. I'm going to switch back to the system diagram again. For those of you just joining, this is basically how it works. 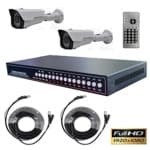 We have sixteen high definition surveillance cameras hard- wired to a video multiplexer using RG59 coax cable. That video multiplexer is what lets me combine the video signal from multiple cameras so I can stream them all on one screen. The video multiplexer is connected our streaming PC, basically a PC with an HDMI capture card and running Open Broadcaster Software, and that's what enables us to livestream. Multiple Camera Live Streaming Video System Page 3 of 3 I'm going to switch back again to the live camera view just to go over again the different camera views that are supported. Here's a four-camera, nine-camera view. Here's all sixteen cameras that are connected, and then we can do things like picture in picture. I can change the cameras that are displayed both in that full screen and in the smaller screen there in the settings. You just go into the menu system and then you can go into mode settings, and on this screen, I can change which cameras are displayed. Here's an alternative four-camera view, two-camera view side-by- side, two-camera view top and bottom, three-camera view, six-camera view, and then back to the picture in picture. Then just one more time, I'll go over how this works. We have sixteen cameras hard- wired to a video multiplexer. These cameras are more traditionally used in video surveillance systems, but they make great use for livestream because there's a lot of outdoor, weatherproof options. There's a lot of infrared options. There's pan/tilt/zoom camera options, and by connecting those to a video multiplexer, you can combine the signals from multiple cameras onto one screen, like you just saw. The video multiplexer has a VJ and an HDMI video output. In this case, I have the HDMI video output connected to an HDMI video capture card on the streaming PC. CCTV Camera Pros custom-builds streaming PCs for customers. We actually put together complete packages like this one. The streaming PC is connected to a high-speed Internet access source. In this case, it's hard-wired to our network router, and we have both a cable Internet access here at the office, and we also have fiber optic connection. I'm using the cable modem right now, and this allows you to livestream to YouTube, Facebook, Twitch TV, Periscope, and, again, it supports multiple camera views like you're seeing here. I'm changing all these screens using the wireless remote that is included with the video multiplexer. If you have any questions about how any of this is being done, if you'd like to use us as a resource to learn how to do this, if we can help you with equipment, you can visit www.cctvcamerapros.com/livestreaming. Thanks, everyone, for watching. Click here to learn more about the HD Livestream Multi Camera Video System used in this video. Click here to learn more about the Live Stream Video Computer used in this video.